Young Krishna is known to be very playful and mischievous. The story goes that as a child, Krishna was extremely jealous of Radha's fair complexion since he himself was very dark. One day, Krishna complained to his mother Yashoda about the injustice of nature which made Radha so fair and he so dark. To pacify the crying young Krishna, the doting mother asked him to go and colour Radha's face in whichever colour he wanted. In a mischievous mood, naughty Krishna heeded the advice of mother Yashoda and applied colour on her beloved Radha's face; Making her one like himself. Well, there is also a legend to explain Krishna's dark complexion. It so happened that once a demon attempted to kill infant Krishna by giving him poisoned milk. Because of which Krishna turned blue. But Krishna did not die and the demon shriveled up into ashes. 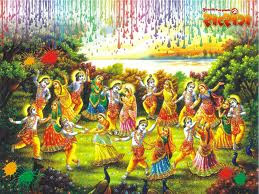 The beautiful scene of Krishna's prank in which he played colour with Radha and other gopis has been made alive in myriad forms in a number of paintings and murals. Somehow, the lovable prank of Krishna where he applied colour on Radha and other gopis using water jets called pichkaris gained acceptance and popularity. So much so that it evolved as a tradition and later, a full-fledged festival. Till date, use of colours and pichkaris is rampant in Holi. Lovers long to apply colour on their beloveds face and express their affection for each other. This legend is wonderfully brought alive each year all over India, particularly in Mathura, Vrindavan, Barsana and Nandgaon-the places associated with Krishna and Radha. In fact, the entire country gets drenched in the colour waters when it is time for Holi and celebrate the immortal love of Krishna and Radha. In some states of India, there is also a tradition to place the idols of Radha and Krishna in a decorated palanquin, which is then carried along the main streets of the city. All this while, devotees chant Krishna's name, sing devotional hymns and dance in the name of the lord.